These injuries are currently managed by various medical specialists, including otolaryngologists/head and neck surgeons, maxillofacial surgeons, plastic surgeons, and neurosurgeons. As a result, consensus does not exist regarding the timing, indications, and treatment modality of these injuries. The series reported in the literature have relatively few subjects and, as might be expected, mostly limited follow-up periods. The use of high-resolution, 1.5-mm axial and coronal thin-cut computed tomography (CT) scanning provides improved diagnostic power for assessing injuries to the frontal sinus and midface [3, 4, 5] and has become invaluable in the diagnosis of frontal sinus fractures. Involvement of the nasofrontal duct is not easily discernible with CT imaging and, as a result, decisions regarding management of the nasofrontal duct and frontal sinus are frequently made during surgical exploration. However, nasofrontal duct injury is strongly suggested when the CT scan demonstrates involvement of the base of the frontal sinus, the anterior ethmoid complex, or both. The nasofrontal duct complex should be evaluated in both the axial and coronal planes. In 1921, Lynch described the first frontoethmoidectomy, leaving the anterior table intact but completely removing the ethmoid sinuses and the frontal sinus floor. An indwelling catheter was inserted for prolonged drainage. In 1951, Bergara and Itoiz devised the osteoplastic flap procedure. They described exposure of the sinus by removing the anterior table, but, unlike Reidel, it was left hinged to an inferiorly based pedicle of pericranium. The flap was replaced at the end of the procedure. This technique resulted in a marked improvement in the overall aesthetic result. In the late 1950s and 1960s, Goodale and Montgomery first described the ablative frontal sinus procedures that are the basis for current surgical obliterative management of frontal sinus fractures. [10, 11, 12] They took the osteoplastic flap procedure one step further, describing methods of ablating the frontal sinus by grossly removing all sinus mucosa and packing it with autogenous fat, essentially eliminating the sinus as a functional unit. Later work described the involvement of the nasofrontal ducts in chronic complications of frontal sinus trauma, presumably secondary to duct stenosis. It then became clear that simple obliteration as described by Goodale and Montgomery was insufficient to completely prevent the occurrence of late sequelae. The importance of removing any retained mucosa in the region of the nasofrontal duct was stressed. [2, 13] Failure to remove all sinus mucosa and subsequent reepithelialization of the sinus was demonstrated to result in late complications such as mucoceles and mucopyoceles. Donald and Bernstein described the first cranialization procedure in 1978. It involved stripping the sinus of all mucosa, plugging the nasofrontal ducts, and removing the posterior table, allowing the brain to expand into the frontal sinus space; the procedure thus incorporated the previous frontal sinus space into the anterior cranial vault. This procedure is still used today, but it is usually reserved for patients with severe comminution of the posterior table. Frontal sinus fractures can be classified into fractures of the anterior table, the posterior table, or both. Isolated fractures of the posterior table are rare. The fractures may be simple, comminuted, displaced, or nondisplaced. Displacement of anterior table fragments, especially when through the inferior and/or base half of the sinus, can cause obstruction of the nasofrontal duct. Displacement of the anterior table can also lead to depression of the forehead and a cosmetic deformity (see following images). 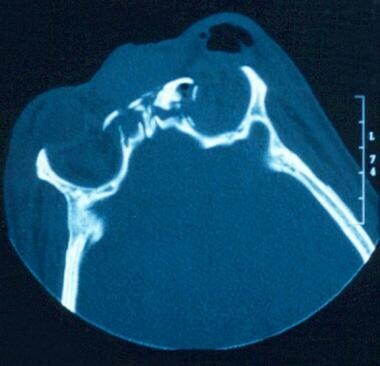 CT scan showing frontal sinus fracture with comminution injury to the anterior table and supraorbital rim. However, the posterior table appears to be intact. More superior cut of CT scan showing frontal sinus fracture with comminution injury to the anterior table and supraorbital rim. The degree of anterior table displacement was sufficient to cause significant aesthetic deformity. Although the fracture spares the base of the frontal sinus and the posterior wall, the sinuses were explored for nasofrontal duct injury. The ducts were found to be intact. The anterior table was repaired, and no obliteration was performed. Posterior table fractures usually occur in combination with fractures of the anterior table and are frequently associated with intracranial trauma. When the posterior table is displaced more than the width of the table, the incidence of CSF leak and dural tears is high. Impinged sinus mucosa between fracture segments may lead to the formation of mucoceles. The frequency of nasofrontal duct injury is proportional to the severity and comminution of the frontal sinus fracture. Injuries to the duct are likely when the fracture is medial to the supraorbital notch and involves the base of the frontal sinus and/or the anterior ethmoid complex (see following images). Unrecognized injury to the nasofrontal duct may lead to frontal sinus drainage and aeration obstruction and, eventually, the formation of mucoceles, mucopyoceles, meningitis, and intracranial abscess. Fracture of the frontal sinus involving the anterior table and both supraorbital rims, medial to the supraorbital notch. Lower cut of CT scan in a patient with fracture of the frontal sinus involving the anterior table and both supraorbital rims, medial to the supraorbital notch. Note the fracture extension through the base of the frontal sinus and involvement of the anterior ethmoid complex. Even though the fracture spares the posterior table, damage to the nasofrontal ducts is highly likely. 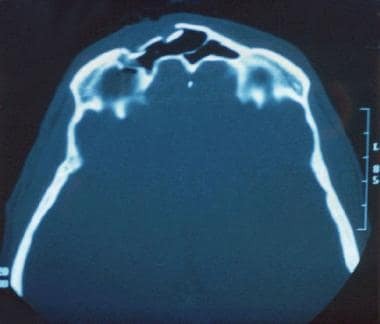 A fracture of the frontal sinus should be considered clinically when a gross depression or laceration is found over the supraorbital ridge, glabella, or lower forehead, as this is the most common finding on clinical examination. Lacerations should be examined gently to determine if any bony step-offs are present. As many as 59% of these patients may present with orbital trauma. Prompt ophthalmologic evaluation may be necessary. A large percentage of patients also may have associated fractures of the naso-orbito-ethmoid complex and midface, which may also suggest involvement of the nasofrontal duct. Gross CSF rhinorrhea may occur if the posterior table of the frontal sinus and the dura are involved in the injury. 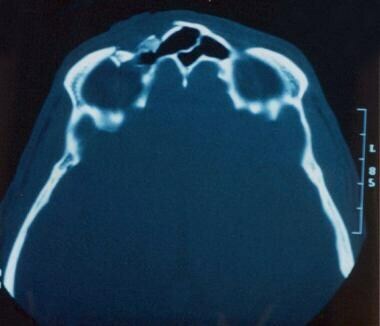 Isolated anterior table fractures are the most common type of frontal sinus injury (see following images). A proposed algorithm for the management of anterior table fractures. Note that in the case of a displaced anterior table fracture with involvement of the nasolacrimal duct, some have also proposed recannulation of the duct. 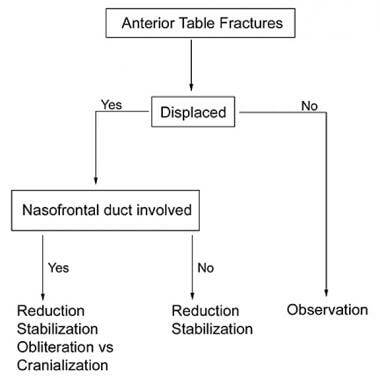 A proposed algorithm for the management of frontal sinus posterior table fractures. In patients with cerebrospinal fluid leak and displacement, obliteration or cranialization is usually indicated. If no cerebrospinal fluid leak is present, the fracture can be reduced and the algorithm for anterior table fractures can be followed. See Image 7. Most nondisplaced anterior table fractures can be managed expectantly and nonsurgically,  since these fractures are typically not associated with mucocele formation, although they may still result in cosmetic deformity. The management of nondisplaced posterior sinus wall fractures is more controversial. Some authors suggest that all posterior table fractures should undergo exploration and be examined directly via sinuscopy or otherwise. Others treat these injuries with close observation and explore if complications (persistent CSF leak) develop. Surgical indications are summarized in the above images. The frontal sinuses are usually highly variable in size and shape. They are usually characterized by 2 asymmetric sinuses that are separated by a thin, bony septal plate. Hypoplasia of the frontal sinus is relatively common, with 2-20% of the population demonstrating some degree of underpneumatization. The nasofrontal ducts are situated posteromedially in the sinus and are the only drainage pathways of the frontal sinus. These may be absent in as much as 80% of the population; these persons simply have a large opening into the middle meatus. When present, the ducts usually run caudally for up to 2 cm. Large anterior ethmoid cells, also known as the agger nasi cells, may bulge into the floor of the frontal sinuses and the nasofrontal ducts. Chronic inflammation in the adjacent thin-walled spaces of both the ethmoid and frontal recess air cells may lead to chronic edematous changes in the nasofrontal ducts, causing frontal sinus drainage problems. For this reason, patients with a history of recurrent anterior ethmoid sinusitis may be at higher risk of developing recurrent frontal sinus infections after trauma to the nasofrontal ducts. Due to the proximity of important anatomic structures, early recognition and treatment of frontal sinus fractures is necessary. Inferiorly and posteriorly, the sinuses are in close apposition to the dura mater, frontal lobes, crista galli, and cribriform plate, usually separated only by a thin, bony plate. The anterior-superior portion of the sinuses is composed of the sturdier frontal bone. Contraindications to surgical repair of a frontal sinus fracture include patient inability to undergo general anesthesia secondary to intracranial injuries, decreased mental status, hemodynamic instability, and pending treatment of other, more potentially life-threatening injuries. Often, many of these contraindications are present in patients with trauma to the frontal sinuses. Definitive surgical treatment of frontal sinus fractures is often delayed for these reasons. Metzinger SE, Guerra AB, Garcia RE. Frontal sinus fractures: management guidelines. Facial Plast Surg. 2005 Aug. 21(3):199-206. [Medline]. May M, Ogura JH, Schramm V. Nasofrontal duct in frontal sinus fractures. Arch Otolaryngol. 1970 Dec. 92(6):534-8. [Medline]. Harris L, Marano GD, McCorkle D. Nasofrontal duct: CT in frontal sinus trauma. Radiology. 1987 Oct. 165(1):195-8. [Medline]. Johnson DH Jr. CT of maxillofacial trauma. Radiol Clin North Am. 1984 Mar. 22(1):131-44. [Medline]. Schatz CJ, Becker TS. Normal CT anatomy of the paranasal sinuses. Radiol Clin North Am. 1984 Mar. 22(1):107-18. [Medline]. Reidel. Schenk Inaug Dissertation. Jena. 1898. Killian G. Handbuch Der Haus, Nasen, Oren, Heilkunde, Dender Und Kahler. 1904. 2:820. Bergara AR, Itoiz OA. Present status of the surgical treatment of chronic frontal sinusitis. Arch Otolaryngol. 1955. 61:616-28. Goodale RL, Montgomery WW. Experiences with the osteoplastic wall approach to the frontal sinus. Arch Otolaryngol. 1958. 68:271-83. Goodale RL, Montgomery WW. Anterior osteoplastic frontal sinus operation: five-year experience. Ann Otol Rhinol Laryngol. 1961. 70:860-80. Goodale RL, Montgomery WW. Technical advances in osteoplastic frontal sinusectomy. Arch Otolaryngol. 1964. 79:522-9. Levine SB, Rowe LD, Keane WM, Atkins JP Jr. Evaluation and treatment of frontal sinus fractures. Otolaryngol Head Neck Surg. 1986 Jul. 95(1):19-22. [Medline]. Donald PJ, Bernstein L. Compound frontal sinus injuries with intracranial penetration. Laryngoscope. 1978 Feb. 88(2 Pt 1):225-32. [Medline]. Bordley JE, Bosley WR. Mucoceles of the frontal sinus: causes and treatment. Ann Otol Rhinol Laryngol. 1973 Sep-Oct. 82(5):696-702. [Medline]. Garg RK, Afifi AM, Gassner J, et al. A novel classification of frontal bone fractures: the prognostic significance of vertical fracture trajectory and skull base extension. J Plast Reconstr Aesthet Surg. 2015 May. 68 (5):645-53. [Medline]. McGraw-Wall B. Frontal sinus fractures. Facial Plast Surg. 1998. 14(1):59-66. [Medline]. Wright DL, Hoffman HT, Hoyt DB. Frontal sinus fractures in the pediatric population. Laryngoscope. 1992 Nov. 102(11):1215-9. [Medline]. Shockley WW, Stucker FJ Jr, Gage-White L, Antony SO. Frontal sinus fractures: some problems and some solutions. Laryngoscope. 1988 Jan. 98(1):18-22. [Medline]. Gerbino G, Roccia F, Benech A, Caldarelli C. Analysis of 158 frontal sinus fractures: current surgical management and complications. J Craniomaxillofac Surg. 2000 Jun. 28(3):133-9. [Medline]. Yavuzer R, Sari A, Kelly CP, et al. Management of frontal sinus fractures. Plast Reconstr Surg. 2005 May. 115(6):79e-93e; discussion 94e-95e. [Medline]. Rohrich RJ, Hollier LH. Management of frontal sinus fractures. Changing concepts. Clin Plast Surg. 1992 Jan. 19(1):219-32. [Medline]. Nahum AM. The biomechanics of maxillofacial trauma. Clin Plast Surg. 1975 Jan. 2(1):59-64. [Medline]. Cormier J, Manoogian S, Bisplinghoff J, Rowson S, Santago A, McNally C. The tolerance of the frontal bone to blunt impact. J Biomech Eng. 2011 Feb. 133(2):021004. [Medline]. Gonty AA, Marciani RD, Adornato DC. Management of frontal sinus fractures: a review of 33 cases. J Oral Maxillofac Surg. 1999 Apr. 57(4):372-9; discussion 380-1. [Medline]. Lee TT, Ratzker PA, Galarza M, Villanueva PA. Early combined management of frontal sinus and orbital and facial fractures. J Trauma. 1998 Apr. 44(4):665-9. [Medline]. Sakas DE, Beale DJ, Ameen AA, et al. Compound anterior cranial base fractures: classification using computerized tomography scanning as a basis for selection of patients for dural repair. J Neurosurg. 1998 Mar. 88(3):471-7. [Medline]. Yoo A, Eun SC, Baek RM. Transcutaneous reduction of frontal sinus fracture using bony tapper device. J Craniofac Surg. 2012 Nov. 23(6):1835-7. [Medline]. Molendijk J, van der Wal KG, Koudstaal MJ. Surgical treatment of frontal sinus fractures: the simple percutaneous reduction revised. Int J Oral Maxillofac Surg. 2012 Oct. 41(10):1192-4. [Medline]. Castro B, Walcott BP, Redjal N, Coumans JV, Nahed BV. Cerebrospinal fluid fistula prevention and treatment following frontal sinus fractures: a review of initial management and outcomes. Neurosurg Focus. 2012 Jun. 32(6):E1. [Medline]. Choi M, Li Y, Shapiro SA, Havlik RJ, Flores RL. A 10-year review of frontal sinus fractures: clinical outcomes of conservative management of posterior table fractures. Plast Reconstr Surg. 2012 Aug. 130(2):399-406. [Medline]. Koento T. Current advances in sinus preservation for the management of frontal sinus fractures. Curr Opin Otolaryngol Head Neck Surg. 2012 Aug. 20(4):274-9. [Medline]. Ginsburg CM. Frontal sinus fractures. Pediatr Rev. 1997 Apr. 18(4):120-1. [Medline]. Jain SA, Manchio JV, Weinzweig J. Role of the sagittal view of computed tomography in evaluation of the nasofrontal ducts in frontal sinus fractures. J Craniofac Surg. 2010 Nov. 21(6):1670-3. [Medline]. Stanwix MG, Nam AJ, Manson PN, Mirvis S, Rodriguez ED. Critical computed tomographic diagnostic criteria for frontal sinus fractures. J Oral Maxillofac Surg. 2010 Nov. 68(11):2714-22. [Medline]. Jarrahy R, Vo V, Goenjian HA, et al. Diagnostic accuracy of maxillofacial trauma two-dimensional and three-dimensional computed tomographic scans: comparison of oral surgeons, head and neck surgeons, plastic surgeons, and neuroradiologists. Plast Reconstr Surg. 2011 Jun. 127(6):2432-40. [Medline]. Lee JC, Andrews BT, Abdollahi H, Lambi AG, Pereira CT, Bradley JP. Computed tomography image guidance for more accurate repair of anterior table frontal sinus fractures. J Craniofac Surg. 2015 Jan. 26 (1):e64-7. [Medline]. Kim YJ, Kim HR, Jun YJ, Seo BC. Usefulness of vascularized galeal frontalis myofascial flap as treatment for postoperative infection in frontal sinus fracture. J Craniofac Surg. 2011 Sep. 22(5):1968-71. [Medline]. Kim YH, Youn SK, Kim JT, Kim SW, Yi HJ, Kim CY. Treatment of the severely infected frontal sinus with latissimus dorsi myocutaneous free flaps. J Craniofac Surg. 2011 May. 22(3):962-6. [Medline]. Noury M, Dunn RM, Lalikos JF, Fudem GM, Rothkopf DM. Frontal sinus repair through a frontalis rhytid approach. Ann Plast Surg. 2011 May. 66(5):457-9. [Medline]. Massarelli O, Gobbi R, Soma D, Raho MT, Tullio A. An aesthetically possible alternative approach for craniomaxillofacial trauma: the "pretrichial incision". Craniomaxillofac Trauma Reconstr. 2011 Sep. 4(3):161-70. [Medline]. Chen DJ, Chen CT, Chen YR, Feng GM. Endoscopically assisted repair of frontal sinus fracture. J Trauma. 2003 Aug. 55(2):378-82. [Medline]. Strong EB, Buchalter GM, Moulthrop TH. Endoscopic repair of isolated anterior table frontal sinus fractures. Arch Facial Plast Surg. 2003 Nov-Dec. 5(6):514-21. [Medline]. Chaaban MR, Conger B, Riley KO, Woodworth BA. Transnasal endoscopic repair of posterior table fractures. Otolaryngol Head Neck Surg. 2012 Dec. 147(6):1142-7. [Medline]. Broer PN, Levine SM, Tanna N, Weichman KE, Hershman G, Caldroney SJ. A novel approach to frontal sinus surgery: treatment algorithm revisited. J Craniofac Surg. 2013 May. 24(3):992-5. [Medline]. Kim DW, Yoon ES, Lee BI, Dhong ES, Park SH. Fracture depth and delayed contour deformity in frontal sinus anterior wall fracture. J Craniofac Surg. 2012 Jul. 23(4):991-4. [Medline]. Muderris T, Bercin S, Sevil E, Kiris M. Management of frontal sinus fracture: reconstruction of the sinus with iliac bone graft. J Craniofac Surg. 2013 Mar. 24(2):e194-5. [Medline]. Luce EA. Frontal sinus fractures: guidelines to management. Plast Reconstr Surg. 1987 Oct. 80(4):500-10. [Medline]. de Melo WM, Colete JZ, Mariano RC, Shinohara EH, Souza FA, Garcia IR Jr. Anterior pericranial flap for frontal sinus duct obliteration: is it a valuable resource?. J Craniofac Surg. 2013 Mar. 24(2):e147-9. [Medline]. Morais de Melo W, Koogi Sonoda C, Garcia IR Jr. Vascular pericranial graft: a viable resource for frontal sinus obliteration. J Craniofac Surg. 2013 Jan. 24(1):e5-7. [Medline]. Heckler FR. Discussion of frontal sinus fractures. Guidelines to Management of Plastic Reconstructive Surgery. 1987. 80:509-20. Pollock RA, Hill JL Jr, Davenport DL, Snow DC, Vasconez HC. Cranialization in a cohort of 154 consecutive patients with frontal sinus fractures (1987-2007) review and update of a compelling procedure in the selected patient. Ann Plast Surg. 2013 Jul. 71(1):54-9. [Medline]. Stanley RB Jr. Fractures of the frontal sinus. Clin Plast Surg. 1989 Jan. 16(1):115-23. [Medline]. Ioannides C, Freihofer HP, Vrieus J, Friens J. Fractures of the frontal sinus: a rationale of treatment. Br J Plast Surg. 1993 Apr. 46(3):208-14. [Medline]. Thaller SR, Donald P. The use of pericranial flaps in frontal sinus fractures. Ann Plast Surg. 1994 Mar. 32(3):284-7. [Medline]. Donald PJ. The tenacity of the frontal sinus mucosa. Otolaryngol Head Neck Surg. 1979 Sep-Oct. 87(5):557-66. [Medline]. Bui TG, Bell RB, Dierks EJ. Technological advances in the treatment of facial trauma. Atlas Oral Maxillofac Surg Clin North Am. 2012 Mar. 20(1):81-94. [Medline]. Hwang K, Song YB. Closed reduction of fractured anterior wall of the frontal bone. J Craniofac Surg. 2005 Jan. 16(1):120-2. [Medline]. Tiwari P, Higuera S, Thornton J, Hollier LH. The management of frontal sinus fractures. J Oral Maxillofac Surg. 2005 Sep. 63(9):1354-60. [Medline]. Whatley WS, Allison DW, Chandra RK, Thompson JW, Boop FA. Frontal sinus fractures in children. Laryngoscope. 2005 Oct. 115(10):1741-5. [Medline]. Donald PJ. Neurosurgery: Skull Base Craniofacial Trauma. J Neurol Surg B Skull Base. 2016 Oct. 77 (5):412-8. [Medline]. [Full Text]. Phang SY, Whitehouse K, Lee L, Khalil H, McArdle P, Whitfield PC. 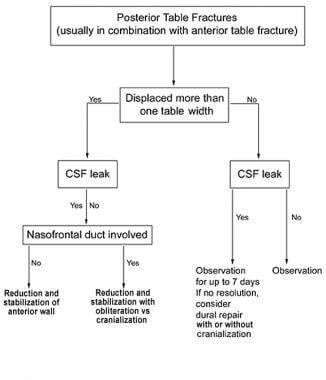 Management of CSF leak in base of skull fractures in adults. Br J Neurosurg. 2016 Dec. 30 (6):596-604. [Medline]. Patel SA, Berens AM, Devarajan K, Whipple ME, Moe KS. Evaluation of a Minimally Disruptive Treatment Protocol for Frontal Sinus Fractures. JAMA Facial Plast Surg. 2017 May 1. 19 (3):225-31. [Medline]. 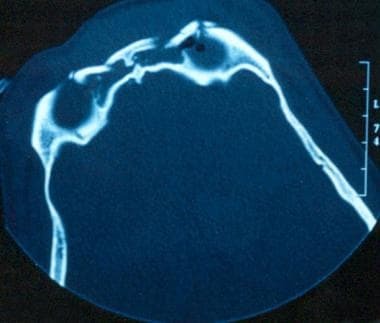 Coronal views of a CT scan in a patient with fracture of the frontal sinus involving the anterior table and both supraorbital rims, medial to the supraorbital notch. Note the injuries to the frontal recesses. Injury to the nasofrontal ducts is expected. More anterior view of a coronal CT scan in a patient with fracture of the frontal sinus involving the anterior table and both supraorbital rims, medial to the supraorbital notch. Note associated orbital blowout fracture.